Key programming on the VAG range of vehicles can be the most complex to understand due to the varying range of protocols used and the different programming methods adopted. Once you have a full understanding of the procedures, key and remote programming can be relatively straight forward. Therefore, we suggest that you attend one of our special one day training courses designed specifically to enable you to understand the varying systems, maximise your programming abilities and get the best from your equipment. 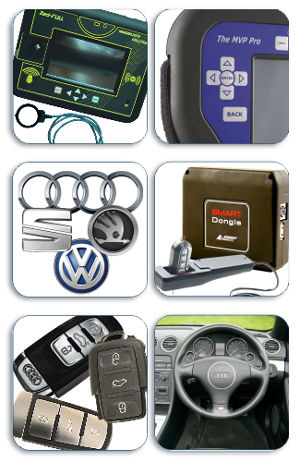 VAG programming procedures include K line, Canbus, Precoded, UDS and the latest Smart key systems on Audi vehicles. The training offers a mix of theory and practical on the different protocols used. It takes a methodical path through the history of VAG key programming, starting with K Line then moving onto Canbus and covering Precoding transponders. Once a full understanding of these systems are attained, the training will move onto the latest UDS dash programming and onto the latest Smart key programming used on Audi vehicles from 2010+. This training takes the myth out of VAG programming and gives you the all the tools you require to maximise your programming opportunities. Anyone who uses Advanced Diagnostics (MVPPRO / AD100PRO) and/or IEA (Zed-FULL) key programming equipment and wants to achieve a full understanding of VAG key & remote programming opportunities, including the latest Audi Smart key system.